It's a shame that a perfectly decent device is bogged down by the still-glitchy Windows RT. With the introduction of Windows 8, it seems almost every computer manufacturer is making its own laptop-tablet hybrid, which, in most cases, is just a tablet with a snap-on keyboard. Asus was the first to create Android tablets with dedicated keyboard docks for its popular line of Transformer devices (we reviewed the Asus Transformer Pad Infinity last year). The laptop-tablet form factor combines the best of both mobile and computing worlds: you have the touch-friendly control that Windows 8 needs and the portability of a tablet, as well as the productivity of a laptop with a dock that adds a physical keyboard, an extra battery, and extra ports. Dell’s answer to the tablet-laptop hybrid is the new XPS 10 Tablet – a 10.1-inch Windows RT slate that you can either buy on its own ($500), or bundled with the keyboard dock for an extra $180. The review unit we received from Dell came with a dock so we used both the slate on its own and in its docked state. We should also mention that we initially had some problems with the device (including the camera and trackpad), but a February 19 Windows update seemed to have cured them, so this review now reflects the up-to-date system. The Dell XPS 10 Tablet gets its good looks from the company’s line of Inspiron Ultrabooks: a coat of black soft-touch paint covers its lid and keyboard dock, which makes the device very comfortable to handle without being a fingerprint magnet. Like any other Windows tablet, the XPS 10’s buttons assume you’ll be using the machine in landscape mode, so its power button and door to its microSD (and optional microSIM) slot are along the top edge. 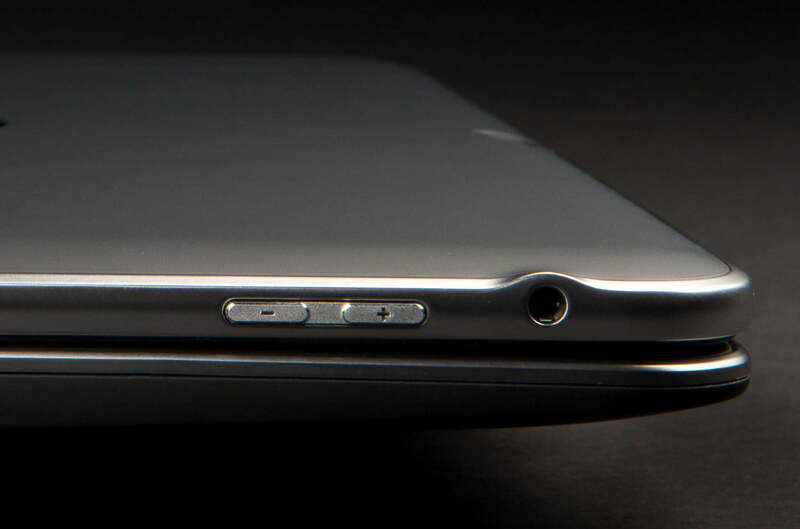 Its volume rocker and audio jack are on the left side, with just one physical Windows home button under the 10.1-inch HD display. 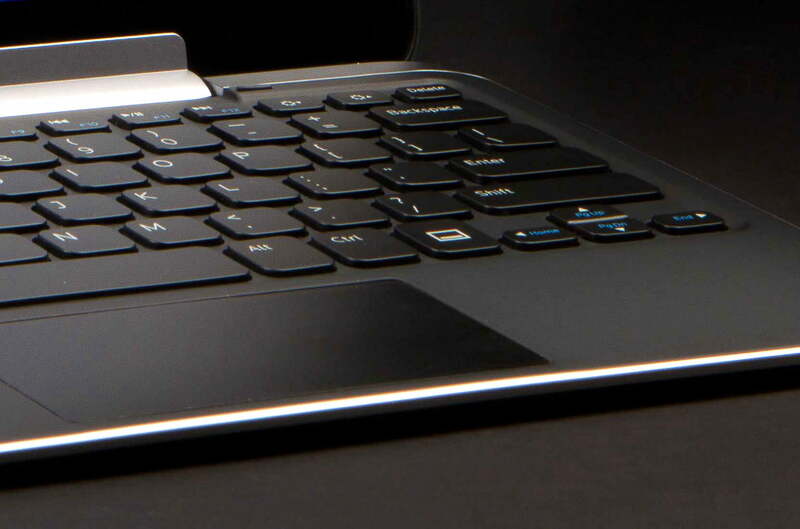 The bottom edge is where the slate attaches to the keyboard, so you’ll find the proprietary power connector and single microUSB port there. At 9.2mm thick and weighing 1.3 pounds, the XPS 10 is just a touch thinner and lighter than the iPad with Retina display, and is solidly built. We didn’t notice any creaking noises or feel like the screen was being pressed in when tapping on the display. The tablet itself is well balanced. We didn’t feel any side was any heavier than the other (and therefore more prone to tipping over) when propping the device on one arm and poking at the screen with the other hand. While the XPS 10 tablet is nice and light, docking it with its keyboard made the whole setup almost too heavy for a mobile device. Together, the dock and tablet weigh a relatively hefty 2.87 pounds, almost matching the 13-inch Asus Zenbook Prime UX32VD Ultrabook, which has a weight of 2.86 pounds. Keep in mind that the Zenbook has full Windows, a full keyboard, and a larger screen versus the XPS 10’s limited version of Windows and chiclet-style keyboard with keys that are on the smaller side. If you’re familiar with Dell laptops, you’ll recognize the XPS 10’s keyboard right away: its keys have really rounded corners. We found the keys to be lacking in depth, making them feel stiff when we tried typing emails with the dock. Docking the tablet is easy. 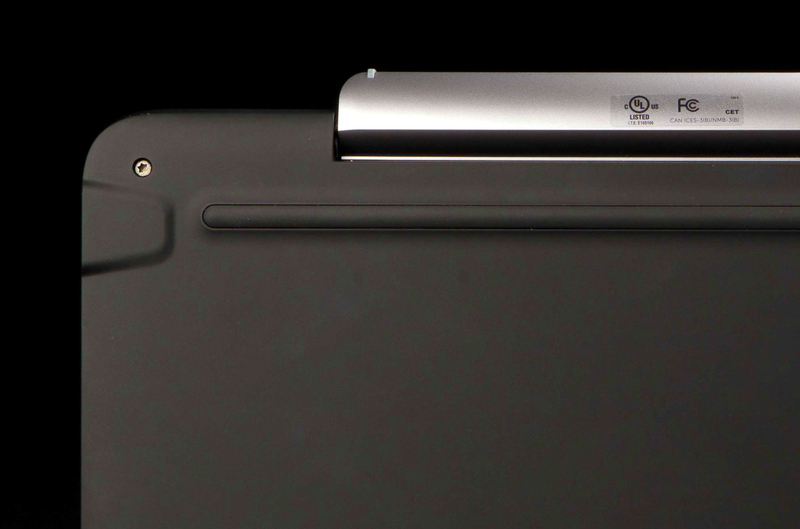 Just align the tablet with the silver hinge and see that the button at the top of the keyboard slides to the right. 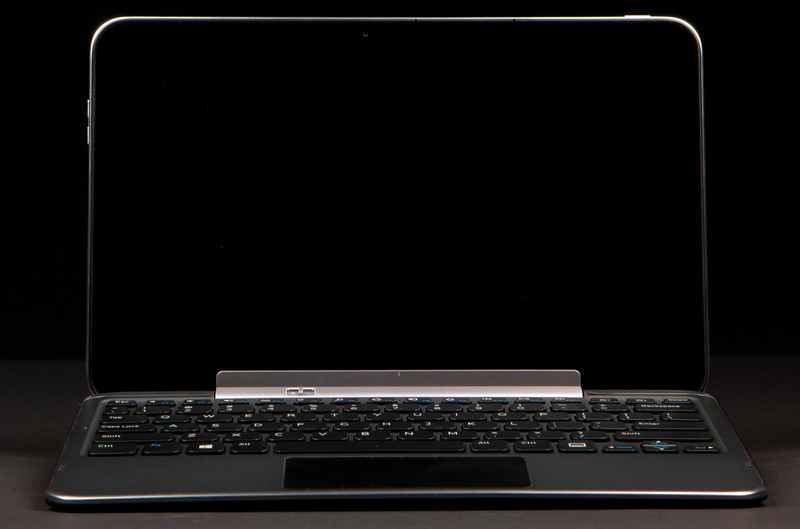 Separating the tablet from the dock is just as easy: simply slide the button on the keyboard to the left to undock. We suggest you keep one hand on the tablet in case it falls. Although Microsoft claims you use Windows 8 with traditional trackpads (instead of touchscreens), we found that wasn’t always true when using this dock. Sometimes, the on-screen cursor would completely disappear and there would be no way to bring it back unless we touched the display with our finger. However, we appreciate having a keyboard for the moments when our fingers were too big to navigate the interface – especially in “Desktop” mode where it looks like Microsoft just shrunk Windows 7 into a 10-inch display. Dell was nice enough to toss in a few dongles to make it easy to connect to other devices. A miniHDMI to full-sized HDMI port plugs into to an HDTV so you can watch movies stored on your tablet; and a microUSB to full-sized USB cord lets you hook up your tablet to anything from a printer to a mouse. As mentioned, this tablet uses Window RT, which is designed to be more of a lightweight operating system for mobile devices like the XPS 10. Both Windows 8 and Windows RT were designed to look like identical twins but their differences are very significant if you’re trying to treat the RT device like a full-powered laptop. RT devices can’t run software designed for Windows 7 and older computers. We couldn’t install Chrome to use as a backup browser when webpages would occasionally stop loading in Internet Explorer, which was frustrating. However, one good thing about RT is it comes preloaded with Office Home & Student 2013 RT, so we were able to open Word documents and create basic spreadsheets with Excel. Although the Mail, Messaging (for social updates), and Skype apps were pre-installed on the tablet, we weren’t impressed by how Microsoft basically forced is to set up and log into the same Hotmail/Outlook/Live account, just to link these apps to your online content. As a long-time Skype and Hotmail user, we use different email addresses to manage different types of content (work versus personal emails), and therefore want the option to connect different email accounts to different apps. We know Microsoft is trying to make life easier for users by asking for just one login across all their services, but our accounts have been hacked enough times to know what a headache a single login could cause. Needless to say, there was also no option for entering in your non-Microsoft email addresses, so if your digital life is heavily integrated with Google or some other service provider, the Windows 8 environment is none too welcoming. For light computing tasks like playing Cut the Rope and watching YouTube videos, you probably won’t even notice that the XPS 10 is running a limited version of Windows 8. It’s a ‘good enough’ device for a Windows user with a single Outlook/Hotmail/Live account and basic Office needs. The reason the XPS 10 uses RT rather than the full version of Windows 8 has to do with the kind of parts Dell packed into the device. Unlike a full Windows machine, RT devices are powered by the same processors found in smartphones and tablets. In this case, the XPS 10 uses a Qualcomm Snapdragon S4 chip and 2GB of RAM to power a 10.1-inch IPS HD display with a 1366 x 768-pixel – a decent-resolution screen, but nothing to write home about. We also found that switching between landscape and portrait modes took a bit of patience. You need to give the device a shake, then wait a second for the on-screen image to shrink a bit before the screen orientation will change. The XPS 10 has either 32GB or 64GB of internal storage, which changes its price tag from $500 to $600. 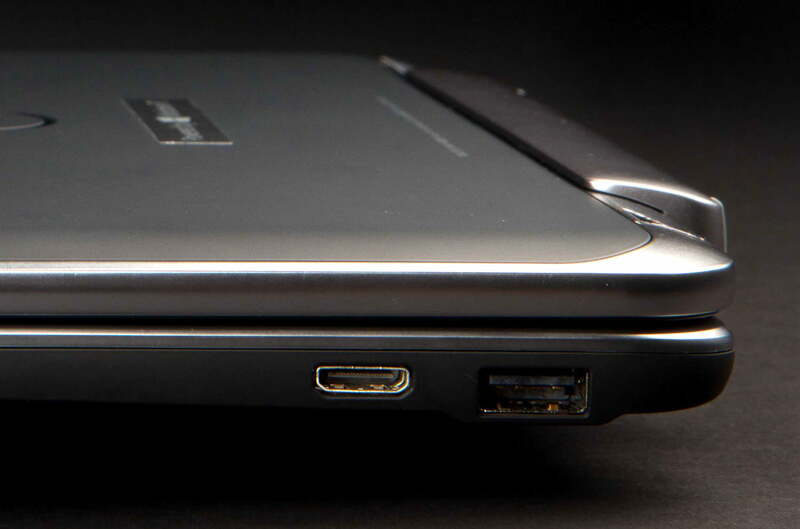 In case you run out of space, you can always expand its capacity by sticking a microSD card into the tablet. Although Dell has already created a microSIM slot at the top of the tablet for 4G/LTE/HSPA+ connectivity, our unit was Wi-Fi and Bluetooth only. Before we updated the tablet’s software, we were disappointed with the front and rear cameras. At a time when 8-megapixel rear cameras are almost standard in most new tablets and smartphones, we were surprised that the XPS 10 only has a 5-megapixel cam (its 2.0-megapixel front camera is pretty typical). The camera app is super basic, and, by default, takes photos at the lowest possible resolution even though the hardware is capable of more. If you don’t bother tweaking the available camera settings, you would probably think its cameras are completely useless. Post-update though, photos from both cameras are showing more realistic colors and the app no longer flickers as you try to take a shot. According to Dell, both the tablet and the keyboard share the same battery, so together they should give you a whopping 18.5-hours of power, or about 9.25 hours when apart. When we put the tablet at full brightness through the browser-based Peacekeeper battery test, we only squeezed 5 hours and 26 minutes out of the Dell slate. With the screen set to 75-percent brightness (and with sleep mode enabled), we were able to use the XPS 10 slate without the dock for about 8.5 hours before needing a recharge. Throughout the day, we watched YouTube videos, surfed the Internet, connected the slate to an HDTV to watch a movie trailer, and even made Skype calls. To approximate an average day of use, the tablet went to sleep between different tasks. In other words, if you are willing to sacrifice a bit of screen brightness, you should be able to get through a full day of work on the tablet alone. The great thing about the keyboard dock is that even if you forgot your power adapter at home, as long as you have the dock handy, you can keep your XPS 10 tablet running. When there are cheaper and more flexible alternatives, you have to be a serious Windows RT fan to want to spend $680 for the 32GB XPS 10 tablet and dock bundle from Dell. And we don’t recommend opting out of the keyboard dock. If you’re not fond of RT, you may be better off with the full Windows 8 Lenovo ThinkPad Tablet 2, which is slightly more expensive, but gives you a fuller experience. Or, for a similar form factor and a higher resolution screen, you might want to check out the Asus Transformer Pad Infinity (if you’re willing to dip into Android), which would give you access to the larger mobile app store in Google Play and save yourself some money in the process. If you’re not scared off by Windows RT, Dell’s new XPS 10 is a solid tablet with a good feel and professional look to it thanks to its coat of soft-touch paint. We were impressed by how easily the Windows RT device recognized everything we threw at it – from plugging in a USB mouse to hooking up an HDTV via HDMI to side-loading movies with a microSD card. The XPS 10’s combination of touchscreen and physical keyboard was what made Windows RT usable. There’s no way we could do a substantial amount of typing on just the tablet and its virtual keyboard. It’s a shame that a perfectly decent device is bogged down by the still glitchy Windows RT.